If you’ve been to a movie theatre lately, you might have noticed that Hollywood has artificial intelligence on the brain. The popcorn flick Avengers: Age of Ultron replays the classic tale of an AI realizing the greatest threat to the world is the very humans that built it, while Alex Garland’s cerebral debut feature Ex Machina shows a young man brought in to administer a Turing test to a startlingly life-like robot. In Neill Blomkamp’s CHAPPiE, perhaps the most interesting aspect of the film is the way in which the eponymous robot’s achievement of full human consciousness comes about by linking up with a bunch of PS4 consoles stolen by his friends, Die Antwoord. The Singularity just kind of happens in the background while our heroes are chased around by Hugh Jackman’s ridiculous mullet-flying murderbot combo. And of course, one of the granddaddies of human-robot interaction films is getting some kind of reboot-sequel thing with the upcoming Terminator Genisys. It’s not just the people in the movie colony who’ve been thinking really hard about artificial intelligence lately, though. No less a luminary than Stephen Hawking has told the BBC that AI could prove an existential threat to humanity, and his statement joins similar ones from Bill Gates and Tesla’s Elon Musk. So, in The Pulp’s continued quest to examine offbeat works of pop culture for hints about what the future may hold, here’s a few of our favourite examples of artificial intelligence. Make sure to bookmark this page in order to ingratiate yourself with our soon-to-be arriving robot overlords. AM hates humanity and spends the duration of the story torturing his remaining human captives with genetic manipulation, sexual assault, starvation and false hope. He’s also basically made them immortal, to be his playthings forever. This cheery story was adapted into a really good adventure game, back in the nineties, of the same name. The game expands on the story by letting you relive events from each of the survivors’ pasts, which are as depressing as you might think. If you’re in the mood for a challenging experience, both with regards to puzzles and content, check it out on gog.com. 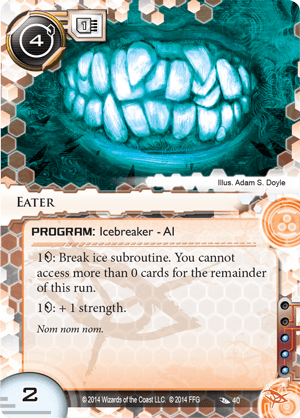 Android: Netrunner, a card game last mentioned in Our Fictional Future: Hackers, numbers quite a few AI among its pool of cards. My favourite one came out recently; it’s an Anarch program named Eater, and the picture on the card is just a mouth with too many teeth and what appears to be a scraggly beard. While some of the other AI available to the Runners seem like stately, upstanding types, like the pensive Crypsis or the ethereal Atman, Eater perfectly fits the punk rock ethos of the Anarchs. His job is to chew through ICE, the electronic countermeasures thrown up by the Corp to stop the Runner, and Eater fills this role splendidly. The only downside is that once he’s done eating through all of the ICE, the Runner can’t actually access what’s on the other side. Luckily, a whole suite of “cutlery” events have also been devised, so that Eater can not only break through the subroutines on the ICE, he can also destroy them entirely. While I admit this is a much better-known example of an AI than the previous two, System Shock’s main antagonist SHODAN stands alongside Portal’s GLADOS as a great example of an AI gone bad. SHODAN, short for Sentient Hyper-Optimised Data Access Network, is the main AI on Citadel Station in the first game, and the spaceship Von Braun in the second. Her voice is a constant irritant/motivation for the player as they make their way through a cyberpunk wasteland, as she contacts you throughout the game over the PA system or via email. To me, SHODAN represents the dark side of the techno-utopian views of Iain M. Banks, whose drones and Minds found in the Culture novels show a much happier interaction between synthetic and organic life forms. What is your favourite example of an artificial intelligence? Let us know in the comments below.